﻿﻿The Eight Gates of Zen were developed by John Daido Loori, Roshi and form the basis of training in the Mountains and Rivers Order. They offer us a tangible way to take up the whole of our lives as a path of spiritual practice. ​Whether we are at work, home or on retreat - these Eight Gates support us to nurture and express our aspiration towards living an authentic, awake life. Zazen is the cornerstone of Zen training. "Za" means sitting, and "zen" means meditation. In its beginning stages, zazen is a practice of concentration, with a focus on following or counting the breath. More than that, however, zazen is a way of self-inquiry, boundless in its ability to reveal the true basis of reality. Through zazen, we practise the unity of the self with the whole universe. Gaining understanding of this has the potential to transform our lives and those of others. The teacher-student relationship is pivotal both to the authenticity of the Zen tradition and to the depth of each student’s understanding of the Dharma. Study with a teacher is regarded as a serious undertaking, the purpose of which is to free ourselves from suffering and confusion. The Zen teacher, in face-to-face interviews (dokusan), addresses the student’s questions and their understanding of practice. The student’s progress occurs with the teacher’s direction and support, while always depending on personal aspiration to engage the spiritual path. In the initial stages, the teacher helps the student to develop a meditation practice, work with emotions and habits, and integrate the moral precepts into daily life. As the student’s practice deepens, so too does the connection to the teacher; and the focus of the work intensifies into the matter of seeing into the nature of the mind and living a life of compassionate action. In New Zealand, Zen students are able to study with an MRO teacher during weekend and week-long retreats twice a year, and also via skype / email as needed. In addition, group discussions of the Dharma (mondos), led by Shugen Sensei or one of the MRO training staff, are held monthly via skype (online video). One of the founders of Zen in China, Bodhidharma, said that Zen does not rely on words and letters. However, most western Buddhist practitioners are not familiar with the historical, philosophical and psychological underpinnings of the tradition, so Buddhist Study is critical to establishing a sound religious practice. Though words are not the same as the reality they describe, when used skillfully, they can imbue our practice with deeper insight, inspiration, appropriate caution, a sense of connection, and context. Teachings are available through the MRO website. For a list of recommended books click here. These and other titles are also available from the library of your local MRO sitting group. Each of the sitting groups offers regular opportunities for practitioners to come together and discuss Buddhist teachings; check in with your local group to learn what's available. Buddhist study is also often a component of the intensive training periods (Ango), held in spring and autumn. To learn about Ango click here. Visiting your local MRO group, you will find both overt and subtle forms of liturgy: the offering of incense, the soundings of instruments, chanting of sutras, and bowing to the altar, each other and to our seat. Like meditation, liturgy is a practice of fully engaging body and mind. It makes visible the invisible, bringing into awareness the shared experience of the sangha, and directing us to realise the awakened mind. For an introduction to Zen liturgy, see Celebrating Everyday Life by Daido Roshi. Right action is the study and practice of the moral and ethical precepts of Buddhism. The precepts define how a Buddha lives in the world. They are based in the experience of the absolute nature of reality (no separation), and yet they function in the world of relative truths — the world of self and other. For a student of the MRO, studying the precepts is an integral part of training, which develops into a formal practice in preparation for jukai (a ceremony of receiving the 16 precepts of a bodhisattva). See Daido Roshi’s book on the moral and ethical teachings of Zen Buddhism, The Heart of Being. 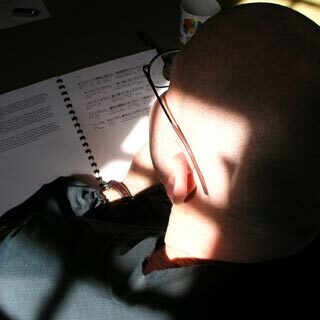 MRO students take up art practice in order to study and experience an aspect of the Dharma. The roots of this approach lie in the history of Zen, where masters used the power of creative expression to convey truths inaccessible to the intellectual mind. Art practice is, like zazen, a matter of wholehearted engagement that relies on letting go of knowing. It is based on an intimate connection encompassing the entire creative process: artist and tools, the relationships between artist and subject, artist and object, and object and audience. When this intimate connection functions, the painting, poem or performance is infused with vitality and authenticity; it contains the power to heal, serve and reveal truth. See Daido Roshi’s book The Zen of Creativity. Our physical body is our vehicle of self-realisation, an experience that encompasses our whole being. The search for self-knowledge is often reduced to a purely mental pursuit. Body practice helps us to unify body, breath and mind through activities ranging from refined disciplines like Tai Chi to familiar activities such as washing our face or eating breakfast. Zen practice must move off the cushion and translate into the sacred activity of living and working in the world. The commitment to practice everyday circumstances requires intention, creativity, honesty, patience and tenacity. An aspiration to serve is an important component. Whatever our work, just as in zazen, we keep returning to the present moment, developing a stillness of mind and an appreciation for the particularities of the effort required. Through such a practice, we can experience the sacredness of ordinary acts, and may appreciate that the same quality is available to us during all forms of work.